I finally made it to Ayelada, the new frozen yogurt place on Route 7 between Niskayuna and Latham. I’d been hearing rave reviews from friends. As expected, it’s yummy. I’d heard that it tastes more yogurt-y than your average frozen yogurt, and that’s absolutely true. All of the flavors I tried (I may have abused my “first time visitor” tasting rights, but the very polite young woman at the counter showed no sign of it) had a tangy this-is-yogurt note to them. 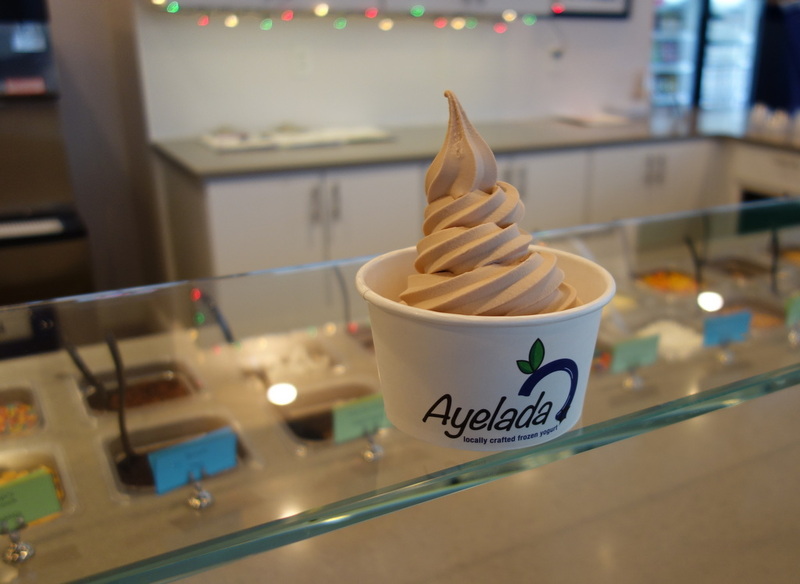 The owners of Ayelada opened their first yogurt place in Pittsfield, MA, after getting addicted to the homemade yogurt that they’d tried as customers elsewhere, and I can understand how this stuff gets addictive enough to drop everything and start making it full time. Unlike most of the trendy yogurt places these days, Ayelada is full-service. A server pours your cup and then adds any toppings that you’d like. You pay a little extra for one or two toppings, but after that you can just go for “loaded” and have them pile it on for the same price. Of course, they tend to pour a reasonable amount on, so I can’t do that thing at Stewart’s where I basically add more chocolate sprinkles than ice cream. Or maybe she would have made my yogurt swim in sprinkles, but I was too embarrassed. In other more important difference from the rest of the frozen yogurt crowd, the batches of yogurt are made fresh on the premises from scratch each day, using locally-sourced ingredients. And it totally tastes fresh and delcious. It’s a welcome change, let me tell you. At our house, we drew the short straw because the only fro-yo within walking distance is TCBY and blegh, that stuff tastes like chemical paste. Ayelada is much, much better. I have heard a few people say that it’s too “yogurty” for them, but between the creamy deliciousness and other flavors thrown in, I can’t quite relate. Each day the Original flavor, which serves as the base for all of the other varieties, is available, plus a changing selection of three other choices. You can check their website or their Facebook page for up-to-the-minute reports of what’s available. On my visit, I finally settled on Nutella. Because Nutella. Generally speaking, Ayelada feels like it should totally be the moms’ choice yogurt. First, it is actual food without over-processed yuckiness in it, but also, the full service bar is just. . . nicer when you’re going out for yogurt with the kids. Because when you’re all lined up against that topping bar and some kid with a dripping nose reaches in for those cookie crumbles just ahead of you, well, that’s no fun. Or when your child is helping herself and she dumps in hot fudge and you’re screaming inside your head, “Do you realize how heavy that crap is?! ?” and then you approach that scale hoping that you will have the massive amount of cash necessary to acquire legally what the kids have just packed into their yogurt cups without a second thought. 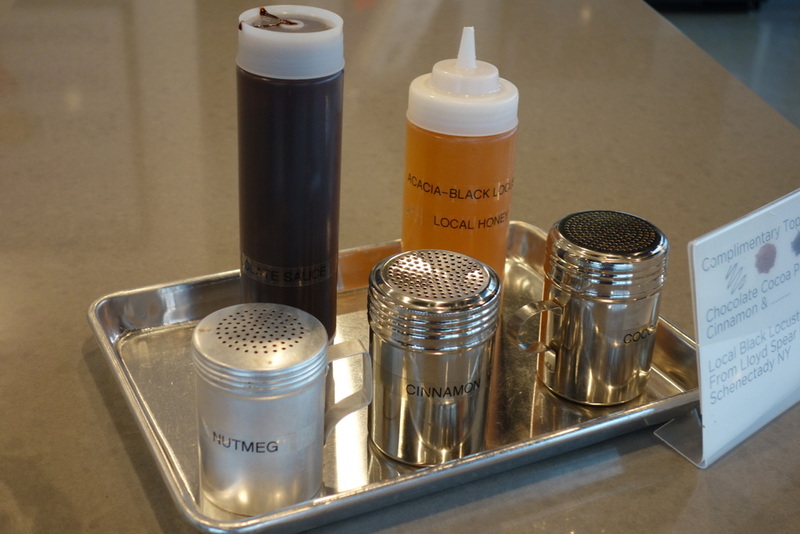 At Ayelada, it’s healthful and clean, with an easily-predictable price. Sigh. That’s better. That local honey is a great indicator here, too. First, they know that yogurt and honey are a beautiful match made in food heaven. Incidentally, my pediatrician has said repeatedly that her healthiest patients eat yogurt with local honey regularly. But it’s also part of the whole friend-of-the-farmer, we-love-local vibe here, too. If you walk around the place, along with glowing reviews, they’ve posted some lovely photographs from some of their local sources of tasty flavors. So you can eat some frozen yogurt and still get the warm fuzzies.